I just completed Thatgamecompany’s Journey. 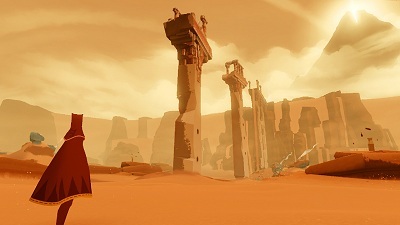 The game depicts a place of desolation and ruin where sands flow like water. You walk among the remains of a civilization that once was. That may sound post-apocalyptic, but it really isn’t. You walk through dead places and get glimpses of greatness and grandeur, hopelessly eroded by time, wind and sands. Here’s the launch trailer for the game — you should see that before you read on. So, you control a robed character. There’s a mountain in the horizon. That’s where you need to go. This is pretty much all you know in the beginning of the game. You go there because… well, there are reasons, but for the purposes of this post, it doesn’t matter. Because it’s there. Because it’s a pilgrimage. Because you have to. The wind blows. The sands flow. 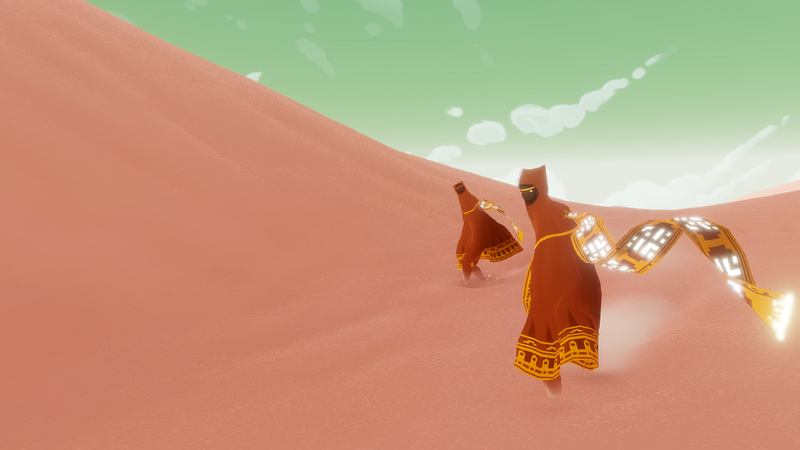 You trek through the desolate landscape. High above you tower the remains of what might have been a bridge. The music in the game is beautiful. They know when to play it how to use it, and they know when to be quiet. The audioscape in Journey is a great achievement in itself. Along the way, you find pieces of cloth that can give you, for a short while, the power of flight. Sometimes they are small scraps that fly around like flocks of birds. Some of them are growing up from the ground, like plants. Some of them form creatures, becoming huge flying whales. You have a scarf that proximity to these things powers up, and you can use that power to fly, until you run out of power and need to recharge it again. Without that power, you walk, your feet sinking into the sand, often struggling against the wind and trying to make it to the top of a dune with obvious effort — or sliding downhill at exhilarating speeds, as if you were skiing. There’s gameplay in there. It’s not complicated, but it’s fun. The game looks absolutely beautiful. 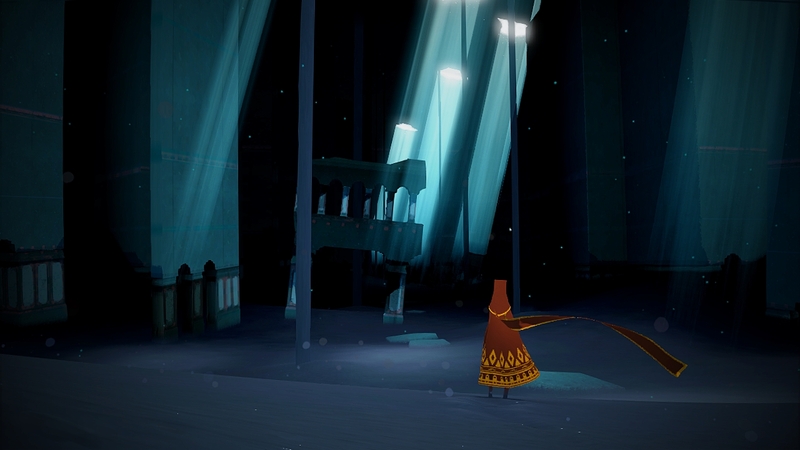 In an age where many games strive for photorealism and amazingly rich environments, Journey opts for a far simpler look, doing far more with color than is immediately obvious. The desert, for example, is red. There are many shades of red; details tend to be scarce. When there is something worth your notice, it immediately stands out, but even then, it’s more about broad and evocative shapes that are heavy with the weight of what could be centuries, even millennia. At some points, you’ll feel as if you are underwater. Deep underground, beyond the merciless glare of the sun, you will walk through the darkness in what could be ancient tombs or the remains of magnificent courts, storage rooms or once-magnificent plazas. The air feels like it’s holding its breath. The scraps of cloth here are furtive, moving with apprehension. Horrible machines slumber here. Sometimes they wake up, hungry for what power you have. You can’t fight them. You’re just a traveler. All you’ve got is determination and hope, and — sometimes — a desperate burst of speed that gets you away from them. Maybe. And then again, sometimes you’re sliding downhill in a carefree avalanche of sand, a pack of the cloth things racing you down; they’re skipping around, playful like dolphins in the surf, and the sun is setting and the world is beautiful, and you catch some air and soar above it for a while, only to land again in a spray of sand. You’re a part of a wave that’s sweeping through an ancient city, empty and worn-down monuments to things that have faded from living memory flicking past you as you dash down what might have once been some grand avenue, and for a while, there’s pure joy in everything. You’re fast, and you’re alive. Throughout all this, sooner later, you’ll see somebody else moving in the landscape. Another traveler, just like you. I’ve often said that I love multiplayer games, except for the other players. It’s mostly a joke, but not entirely; there’s that whole “being harassed by a homophobic, racist and misogynistic 13-year old” aspect to it that I don’t need to go into detail on. I do, however, love playing online with my friends, especially if we can do something co-operative. Journey doesn’t let you do that. If you’re online, it just inserts other people into your game — but just one person at a time. There are no crowds here, just chance encounters with other lonely travelers. You don’t know who they are. There’s no way for you to choose who you’re playing with. You don’t have to do anything with them. They’re just there, playing the game, and it’s easy to ignore them — stay away from them, and soon they’re gone. I ignored them, in the beginning. There was some initial interest at my first encounter — “hey, look, there’s somebody else” — but after we’d looked at each other for a while, we both just turned away and went off to do something else, and when I looked back, I was alone. That happened a few times. But there’s a section towards the end that’s hard — not challenging, really, but it’s emotionally draining. The sand is gone; in its place is just snow and merciless wind that tries to push you back. The light that powers you gets drained instantly; you can no longer fly. You have to make it through on foot. And there was another traveler there. We were moving together, and we fell into a rhythm. Here, for the first time, I noticed that when I and my companion got close enough, we would charge each others’ power a little. It made progress a little easier. It felt like we were huddling together for warmth. There were gusts of wind that threatened to throw us off the mountain, and together we took shelter behind rocks, waiting for them to pass. The snow and the cold turned our red robes stiff and white, but when we were that close, there was a little light, a little warmth. I know that in terms of the game mechanics, it made no real difference. But it felt warm. We climbed that mountain together. Before, I would have ignored him; now, if he fell behind, I turned to watch, to see if he was all right. If he moved faster than I did and I lost sight of him for a moment, I’d take a few more steps and see him standing there, looking at me. Now, I have no way of knowing if this was the same player throughout the entire experience. Especially towards the end, there’s a section where we got separated a few times, and I know the game could have pulled a switch on me then. But I don’t think it did. By then, we had an established rhythm, and I think it was the same player. I want it to be the same player. And I realized that not knowing who it was made it better. That uncertainty shaped the experience. His decision to stay with me felt significant. I know a friend will stay with me. There would be no discovery. There wouldn’t be that shared sense of wonder. As we were making the very final push after an exhilarating flight over the landscape, we were back on foot, walking towards what I knew had to be our final goal, he signaled to me once; I signaled back. He did it twice, I did it twice. Three times. There wasn’t much content there, but the significance felt overwhelming — we were confirming to each other than yes, we’re here, we made it. We made it together. And then we stepped into the light. I’m surprised by how few people seem to notice this, but each player gets their own symbol signature on each playthrough. It’s easy to tell your co-players apart when you look at their symbols. Well, I think the fact that only a few people notice that says a little something about how easy it really is to tell people apart. =) I certainly didn’t notice, but that’s a very cool way of doing it. Just completed this game and I’m stunned. One of the few games that actually moved me, almost made me wet my eyes. More games like these! I've got more rhymes than I got gray hairs, and that's a lot because I've got my share.